The Los Angeles Police Department (LAPD) has declared “Eric Holder” wanted in the shooting of Grammy-nominated rapper and activist, Nipsey Hussle. The police department via its official twitter handle declared Mr Holder wanted further appealing to the public to come forth with possible information of the suspects whereabouts. 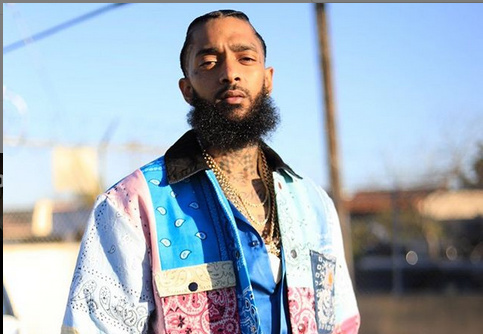 “Eric Holder is wanted for Homicide in the shooting of Nipsey Hussle. He was last seen in a 2016 white 4 door Chevy Cruze CA license plate 7RJD742. Anyone with information related to his whereabouts or this deadly shooting is urged to contact South Bureau Homicide at 323-786-5100,” they twitted. Nipsey had asked him to leave his property due to prior conflict of He was, but he felt disrespected so he came back to do the shooting. The L.A police have already declared him wanted. The late rapper, whose real name is Ermias Asghedom, was killed outside the clothing store he owned in Crenshaw. The gunman opened fire at He was then jumped into a getaway car.